About - 515WINEWITHDESIGN- A UNIQUE ART EXPERIENCE WITH A PERSONAL SPIN! 515WINEWITHDESIGN- A UNIQUE ART EXPERIENCE WITH A PERSONAL SPIN! Owner, Marcy Davidson, has taught art for over 39 years. 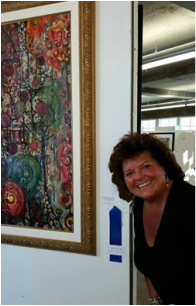 She is an award winning artist and a National Board Certified Art Teacher. The painting process is made fun as Marcy leads the group through each and every step. The night will be filled with laughter and a guaranteed good time with a great painting. THIS will not be like other SOCIAL PAINTING events as I PROMISE you will Leave with a QUALITY painting! My job is to make you look good and I take that seriously! Each event has a unique canvas that has been prepped and made special in some way. I strive to make every event a truly artistic experience! Our studio is for our painters only. Everyone needs a paid seat to stay during classes. Please DO NOT bring your children/baby to class as courtesy to others who are enjoying a "night out"! 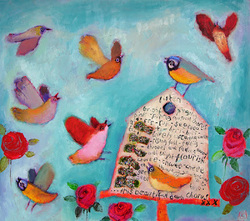 Host a Private "515 Art Party" at your home or place of business! Invite 10 adults or 10 children and the "Host" paints for free. Kids parties start at $30/per child and birthday host is free. There will be an additional cost for any events outside of a 50 mile radius.